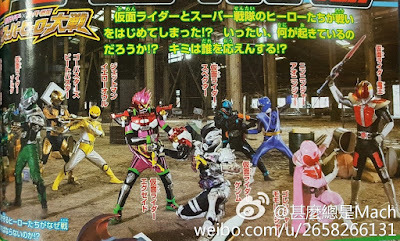 Finally, a scanned image of a scene from Cho Super Hero Taisen that is straight from the pages of the newest issue of Terebi magazine has surfaced featuring our first look at the movie's super hero battle royale! And looks like it really is a battle royale as we can see from the image above, this is not a Rider VS Sentai movie anymore! Everybody is going head to head against everybody! "The game world launches an all out attack in the real world! And in front of the Gamer Riders and Kyuurangers, an "Arena of Death" materializes and the fate of the world will be decided here! Trapped in this dimension of unprecedented puzzles connecting our world to the game world, a generation of heroes must fight to the finish in this battle royale! Cho Super Hero Taisen is slated for a March 25 release in all japanese cinemas! Momo Ranger: NO DAD NO! 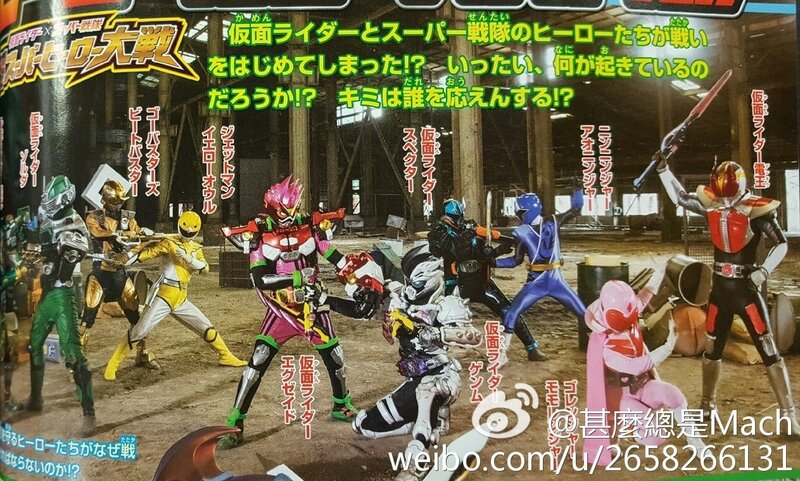 Specter vs Aoninger seems to be a cool fight. Hope their characters appear in the plot and have good screentime. Intrested to see this now mainly cause it's not limited to rider vs sentai. Also intrested in this film due to it revealing "new type of heroes"
Wonder if we will see any more tributes to Shotaro Ishinomori's other heroes, like Skull Man, Kikaider, or anything like that? This movie sounds really interesting! Too bad it's only in Japan... Well, at least once the DVD comes out, and a sub group develops said subs, I'm sure I'll enjoy it. Got any thoughts on Beet vs Yellow Owl? We need more cameos from other Ishinomori's tokusatsu heroes especially Kaiketsu Zubatttt! "Intrested to see this now mainly cause it's not limited to rider vs sentai. Also intrested in this film due to it revealing "new type of heroes""
I was gonna say the same thing. I also wanna see Aoranger vs Big One, Midoranger vs Battle Cossack, Battle Kenya vs Denzi Blue (Bonus points for Gavan cameo), Goggle Black vs Dyna Black (Bonus points if Souji's/Kyoryu Green's father shows up), Ninja Red vs Kuro Kishi, and Bouken Silver vs Kyoryu Gray. Fun fact: The guy who played both Goggle Black and Dyna Black almost played Change Dragon. If it were Magi Yellow, it'd be a joke about how it's the same guy, but I don't know that much about Jetman to find a connection. I think that one might just be an odd one though because I just read what I can about Raita/Yellow Owl, and he couldn't be more different from Jin/Beet Buster aside from the animal/nature motif... unless it's the Doubutsu version of Jin, in which case, they have cooking in common as well. If Kamen Rider Skull appears, there may be some Skullman references because that's what Kamen Rider Skull is based on and an homage to.